This Item is a Pre-Order and will arrive on: Tuesday May 14th 2019 ! FEB190559 - During a high-speed chase with the murderous Grotesque, the villain hits Batgirl with a souped-up stun gun that fries the device implanted in her spine. 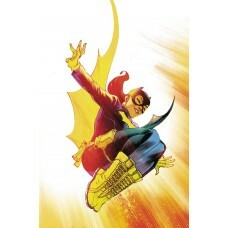 (That thing that helps her, you know, walk and be Batgirl?) Babs finds herself in for a whole new world of hurt now that old wounds have been opened up-and so does Grotesque. Collects BATGIRL #26-29 and ANNUAL #2 plus a story from BATGIRL #25.